Here is your Christmas side dish. Forget the Brussels sprouts w/ bacon, this is better. I buy the most delicious pork sausage from an Italian butcher in NJ, no nitrates, no preservatives, just pork, spices and salt. Yes, it can be done. I buy it in bulk at my farmer's market and keep it in the freezer all winter, so when the market is closed I always have some on hand! I use it sparingly. Since I am not a big meat eater, I use only 1 or 2 links when a recipe calls for sausage. I just want it for flavor. Use as much as you like, or as little. Here, for 2 cups of Brussels sprouts, I used 2 links. It's easy, and you can serve this at room temperature, so not to worry, you can make this an hour ahead and have it ready. Here's Lori Lynn's simple recipe. Trim and slice the sprouts in half. Lay out on a baking sheet and drizzle with olive oil and sprinkle w/ kosher salt. Roast at 400F for 20-25 minutes, shaking the pan during the half way point. You want them to be caramelized and golden brown. While the vegetables are roasting, remove the sausage meat from the casings and crumble into a skillet. My sausage is lean, so I add olive oil to the pan. Cook the crumbled sausage meat for about 10 minutes, until nice and crispy brown. Mix with the roasted brussels sprouts on the pan, and then pour onto a platter. 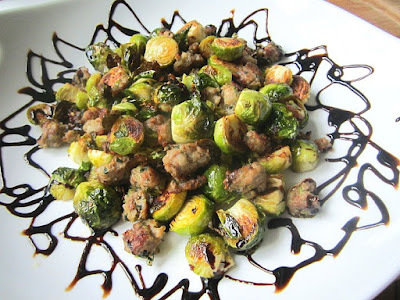 Drizzle decoratively with balsamic syrup. Well...I don't know about genius??? But it surely was a bit hit around here (twice already). This sounds wonderfully easy. I need a potluck dish. I think this is it.